vegan drinks: coming to london this week! COR BLIMEY! it’s about time! vegan drinks are finally coming to london. sure, here in LA it’s a regular occurrence—but this is london’s official “vegan drinks” gathering! epic news, if you ask me. let’s support the UK’s capital in getting pissed whilst celebrating the vegan lifestyle. 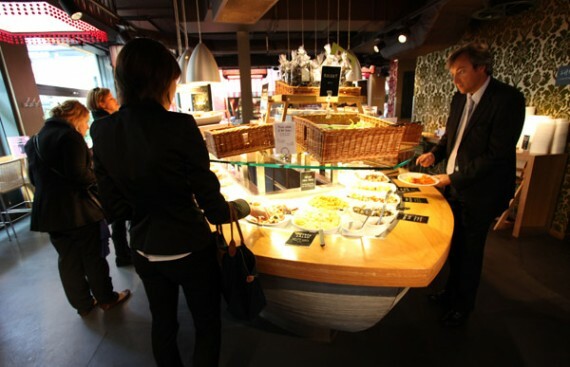 the food boat at tibits...it will be even better with vegan humans and vegan booze! 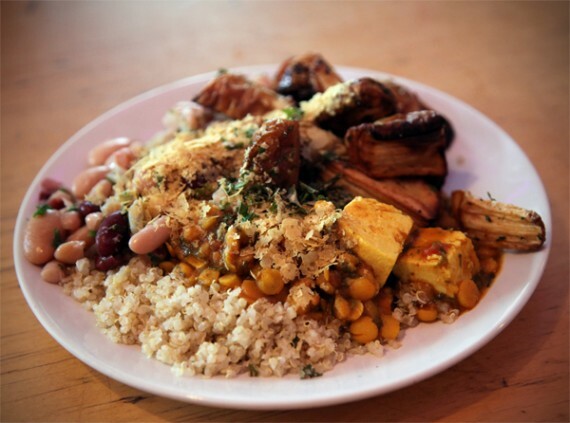 in honor of fat gay vegan’s announcement about a soon-to-be entirely vegan multi-vendor marketplace in london, today we’ve decided to feature one of our favorite restaurants in the city: inspiral lounge. we’ve been singing inspiral’s praises for ages, and have never had a bad experience there (other than the time i had a massive dessert craving and they were out of their amazing tiramisu!). the almost entirely vegan cafe (they have dairy milk on hand for coffee and tea) is just a short walk from the camden tube station and has a stunning view the canal and market. prices are low and the food is good—they’ve got ready to go meals, a deli counter, baked goods, and ice cream all for the taking. we’ve blogged about their set meals before which come with an entree and a side (i highly recommend the tofu tarragon parcel! ), but on our latest visit we went with the buffet style option. we each got a “regular bowl” for £5.95 and had it filled with to the brim with wholesome selections. 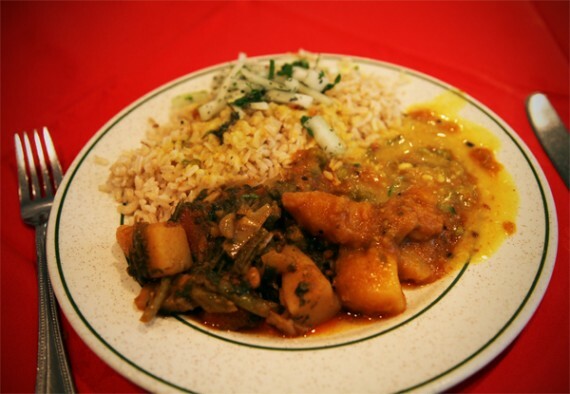 Indian-inspired curries are the national dish of my home country, England. 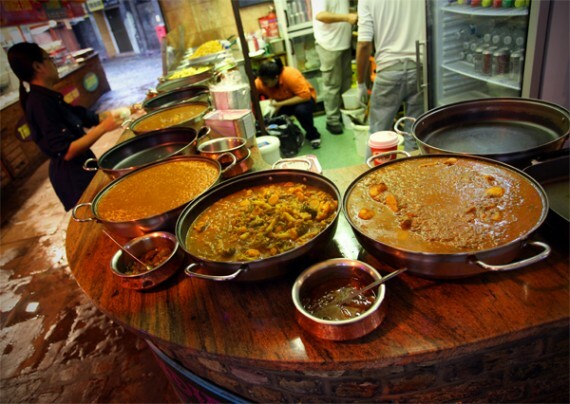 We Brits eat an astonishing 3.5 Indian dishes per person EVERY WEEK, we have over 10,000 Indian restaurants (as opposed to “only” 1,400 McDonald’s outlets) and Tikka Masala is the number one consumed dish by a very wide margin in the UK. Indeed, Fish and Chips have long been relegated to and also-ran in the national culinary identity league. As a vegan, I’ve yet to find an Indian restaurant that can’t cater to my preferences. 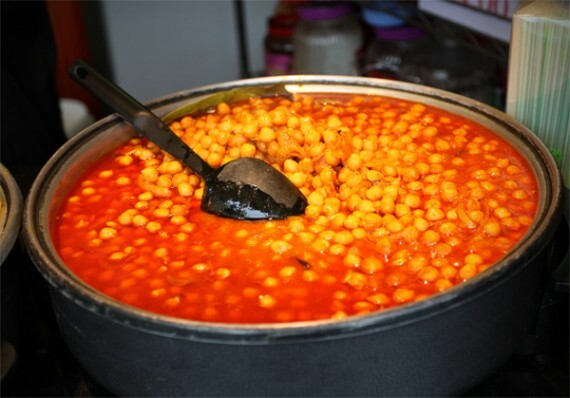 Most can prepare vegan dishes if you ask that they not be cooked with butter ghee, and instead use oil or vegetable ghee and omit any yoghurt or cream. Also, there are many Indian restaurants (often Hindu owned or run) which have a strict lacto-ovo vegetarian policy having no meat anywhere on the premises. One such restaurant in London is Indian Veg Bhelpoori House which has stood for over 30 years on picturesque Chapel Market in Islington, a few minutes walk from Angel tube station or a nice stroll from busy King’s Cross station. 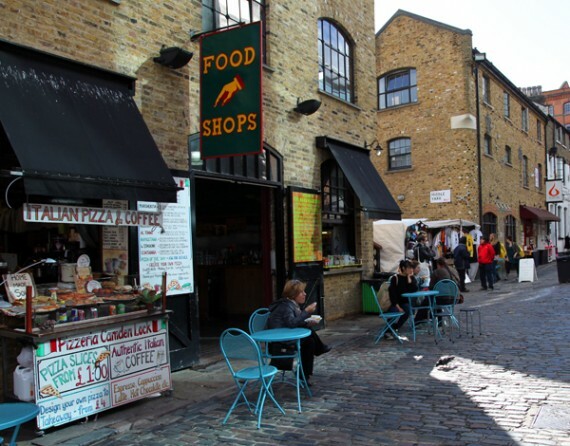 Chapel Market is a narrow cobbled street that has hosted a daily market since Victorian times. Despite much modernization and full immersion into the cultural smorgasbord of the area, Chapel Market oozes old time London – one could be in the 1940s or the 2000s. Sometimes it’s difficult to tell depending on your viewing angle. 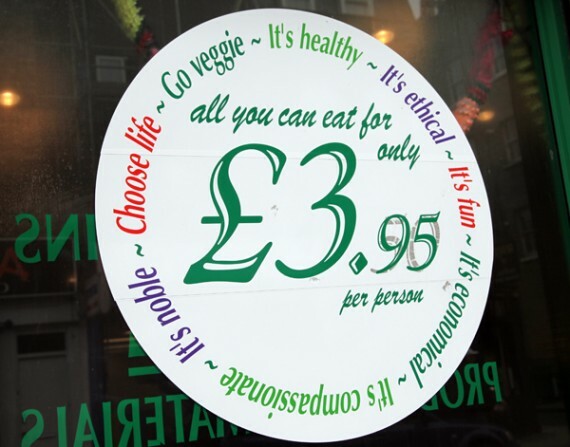 Crammed into what looks like the ground floor space of three large Georgian houses, Indian Veg Bhelpoori House has loud green banners outside proclaiming things like “A vegetarian diet will save the world!” and “Come and try our £3.95 all-you-can-eat buffet!”. Yes, the restaurant is at the same time lovingly familiar yet absolutely quirky. 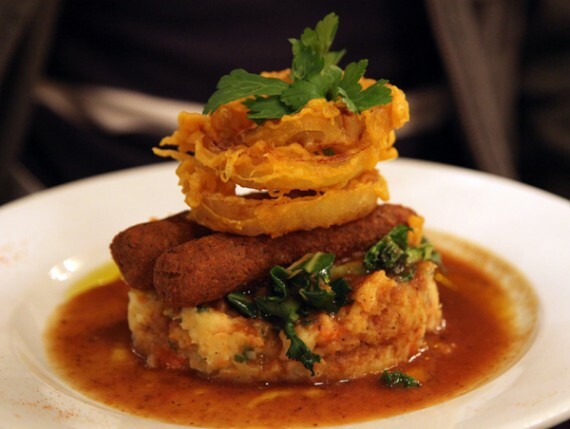 manna in london really does offer vegan fine dining at its best. 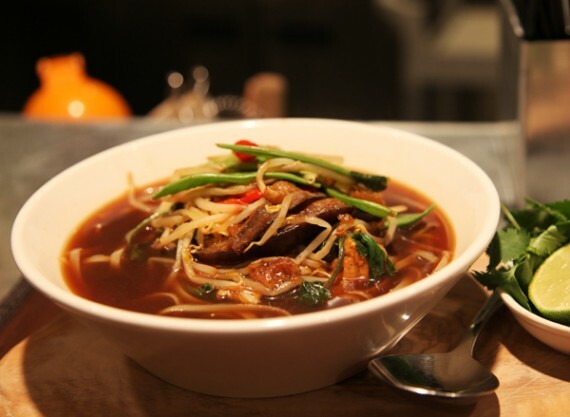 located at the end of a quiet street in primrose hill, the small restaurant boasts elegant surroundings, friendly service, and absolutely exceptional food. 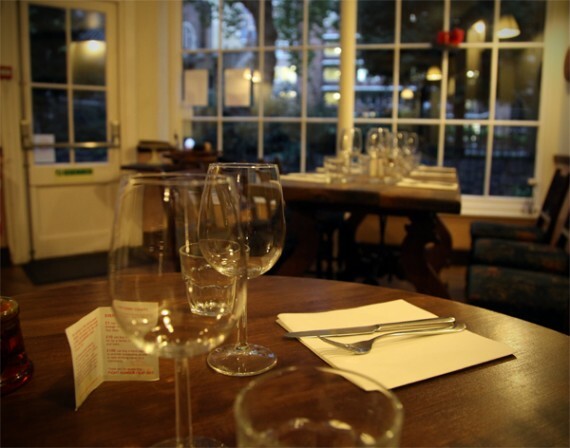 it’s the perfect spot for a romantic evening or a slap up sunday roast, just be sure to arrive with a full wallet and an empty stomach. 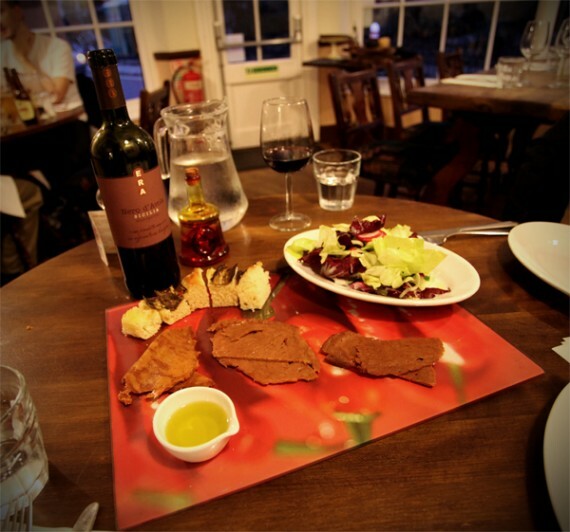 we hit up manna in february when we visited the UK, and as usual, we started with a basket of bread. it sounds simple enough, but this dish is phenomenal. 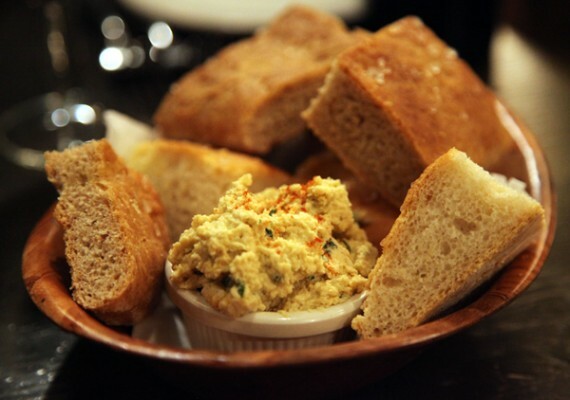 soft warm dough straight from the oven to our table, served with a pot of cool chunky hummus. the perfect beginning to a perfect meal. though we’ve been to manna several times and we love to try new things, we NEVER stray from the bangers and mash. we order these without fail on every visit to share, because they are so damn irresistible. the plate comes with a huge mound of fluffy whipped parsnips and carrots, topped with seasoned greens, seed-based vegan sausages, and two massive battered onion rings, all in a red wine sauce. the sausages and onion rings especially are just unbelievable—like a fancy gourmet vegan version of junk food. i would kill to have this meal available in los angeles. we also split the “build your own meal” combo, which comes with the choice of any four side dishes arranged on a plate. this just in, folks! 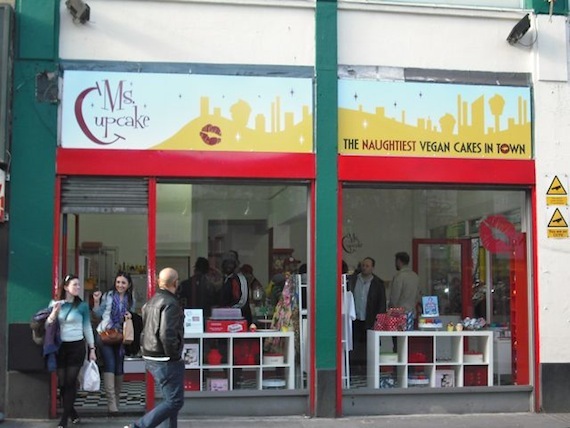 ms cupcake has officially opened london’s first all vegan bakery and it looks incredible. 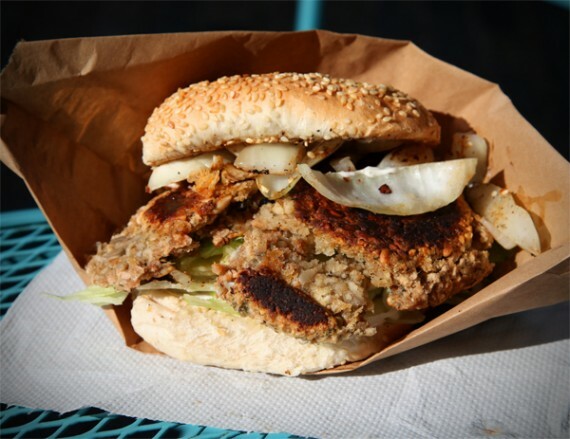 our blogger buddy fat gay vegan was there at the scene in brixton and not only did he write an awesome post about the new shop, but he also sent us some exclusive photos for today’s quick bite. 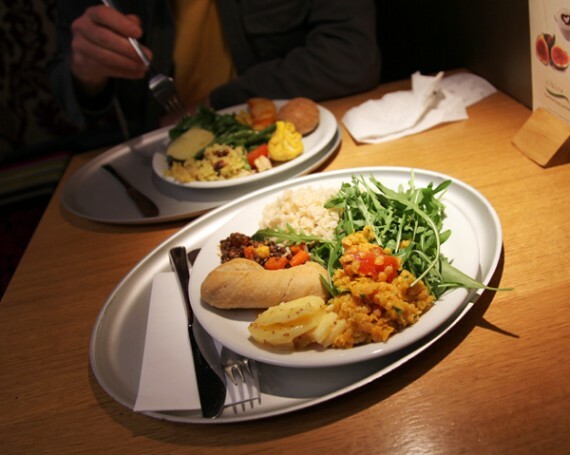 tibits vegetarian restaurant is one of our favorite places to eat in london. we were first alerted to this place when rachel did a field report on it back in 2010…so it’s kinda fitting that we revisit it today on rachel’s birthday (HAPPY BIRTHDAY, RACHEL!). we’ve eaten at tibits a few times now, and haven’t been disappointed yet. i’d rank this as a “must visit” eatery when in london. 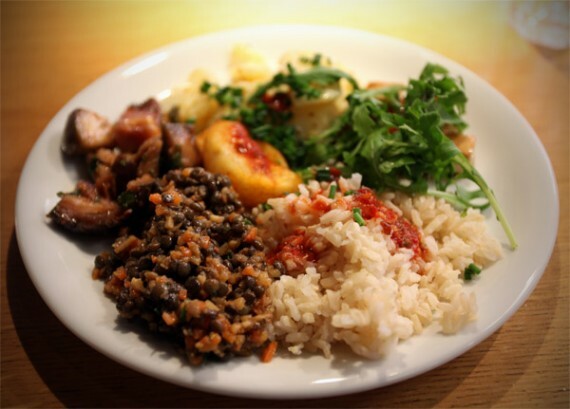 great location, great food, great prices—tibits has it all! how would you like to spend a rainy english evening with a warm bottle of sake and a massive spread of vegetables, noodles, and sushi? 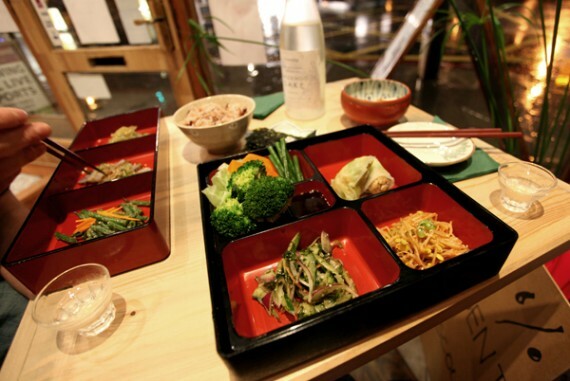 thankfully london has its very own entirely vegan, entirely organic, and entirely delicious japanese restaurant called itadaki zen, where you can do just that. we checked out itadaki zen for dinner one evening and thoroughly enjoyed ourselves, despite the fact that we left the restaurant much poorer than when we arrived. 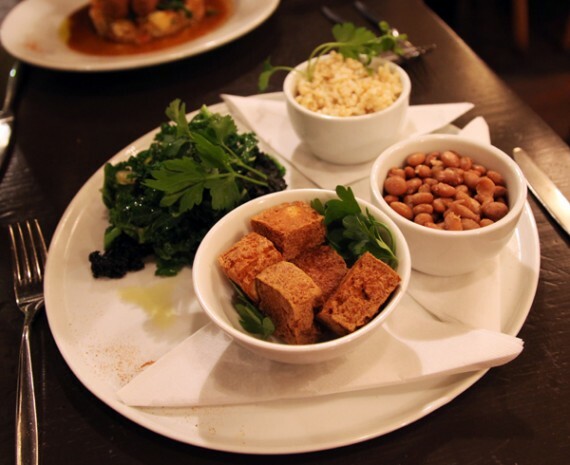 there’s no shortage of delicious vegan food in london, and one place that’s definitely worth a visit is vitao in soho. the small eatery has a sort of hippie vibe, and a very complicated menu depending on the time of day you’re dining. As a boy growing up in England, my mother used to cook a Sunday Roast every week. It was always a big performance, with lots of ingredients, interminably long cooking time and a somewhat formal consumption ritual of sitting at the big table, usually reserved for guests. Sometimes, though, (when we could afford it) we’d go out for our meal and my memories are filled with those occasions: smiling restaurant staff, large plates of food and plenty of subdued light from the London skies. I also look back with sadness on the cruelty that was on my plate: the flesh we so fancifully fried was quickly relegated to a meatona-non gratis as I became vegetarian and then vegan. Indeed, I abandoned Sunday Roast many years ago in despair of such meaty plates all around me. Fast forward way too many years for me to remember, and I can gladly confirm that the Sunday Roast is back in my life with a vengeance – at Manna restaurant in Primrose Hill. 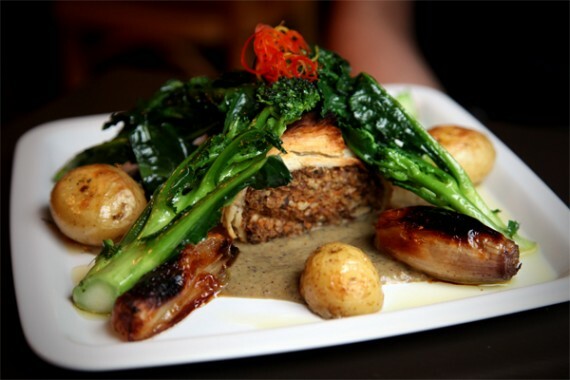 In fact, special vegetarian Sunday menu items have been served at Manna since the 1960s, and more lately their Vegan Sunday Roast delivers a traditional, yet superior (and of course cruelty-free) offering that’s to die for. As a boy, I would spend my summers in Rome being dragged around the piazzas by my bohemian mother. My father is an Italian chef, restaurateur and hotelier, and I suppose some of his passion for food and good service must be in my DNA. Although my food preparation skills leave a lot to be desired, I know when I’m eating good food, and getting good service. Of course, “fine dining” in a vegan sense is rather difficult to find wherever one goes – and so I was delighted to find a highly vegan-friendly vegetarian Italian restaurant in London. Like all real Italian restaurants, Amico Bio is owned by a family, one of which is the Chef. In this case, the genius behind the restaurant is proprietor Pasquale Amico who has partnered with his cousins Bruno and Enrique to create a truly superb experience which envelopes your senses even before you walk through the door, and continues as a happy memory long after your visit. Back in the early 80s I lived in Camden Town, North London. It was a wonderful place to be. I could (and did) pop to the Camden Palais to see The Smiths perform. I nightclubbed there with Blondie, Ringo Starr and even Iggy Pop (but I don’t recall much of that evening…). Camden is known mainly for its street market which, back then, was only open on Sundays. Unless you were visiting specifically for the market it was best to avoid the whole area, as thousands of Londoners and tourists would descend, rendering it impassable for everybody else. 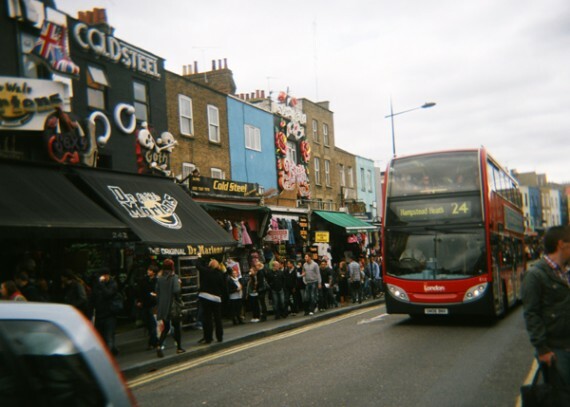 Nowadays, the laws of supply and demand have prevailed and Camden Market has expanded to about two square miles with hundreds of stalls and FIVE dedicated food areas. The market is also open seven days a week, and now sells everything from boots to boiled bagels. Sometimes when we visit London, we stay in Camden – it’s convenient for getting around and the late night scene (although no longer at the now-defunct Camden Palais) means that there are plenty of bars and clubs open to the wee hours. One of our favorite places to chill is in the Hawley Arms, the world-famous watering hole oft-frequented by Amy Winehouse, Blur, Oasis (of course, never at the same time) and Alice Cooper, to name but a few. Steps away from the Hawley Arms is the northern part of the market which is built under old railway arches and a train repair shop right by the canal. The place is beautiful, and really worth a trip when you go. We visited a few vegan places there last autumn, but none was more memorable (in the worst way possible) than Ha Ha Veggie Bar. 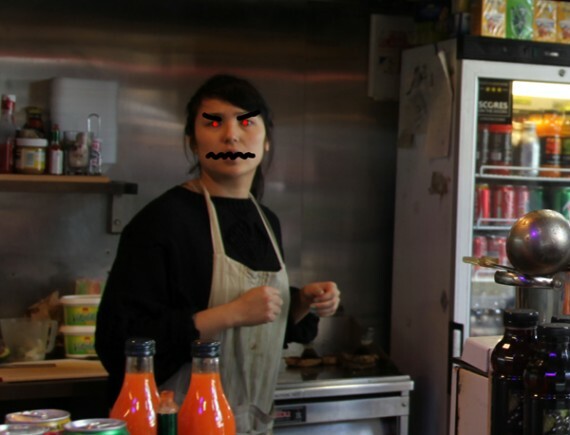 We showed up mid-morning just as the market was getting going for the day and were greeted in a somewhat sullen manner by the lady serving at the counter. After establishing that nearly everything was vegan (other than the real cheese option), we ordered the Garlic Home Made Veggie Burger, which she prepared on a hot grill inside the stand right in front of us using fresh ingredients. After a wait of about 10 minutes we were handed a plump, juicy burger with grilled onions, crunchy lettuce and wonderful vegan garlic mayo. I’m glad we ordered only one to share, because it was way too big for one person to eat alone. 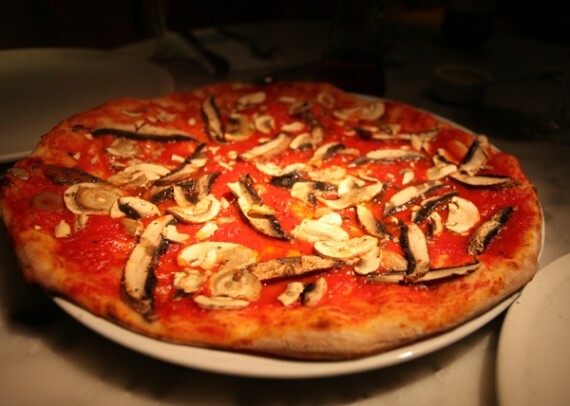 As a London-resident lacto-ovo vegetarian for decades, I’d always enjoy a trip to Pizza Express. The stone cold marble tables, tiled floor and dim halogen lighting set an urban chic vibe alongside some amazing pizza offerings, many of which are vegetarian. Re-visiting Pizza Express, though, as a vegan required some reorientation with both the the menu and ordering tradition. Pizza Express uses a brick oven and hand creates all its dough from scratch daily, as well as preparing fresh ingredients for all the pizzas. The menu often changes, but there is a common core of excellent pizzas, and many of the famous stables (like my old favorite, the Fiorentina) are vegetarian. 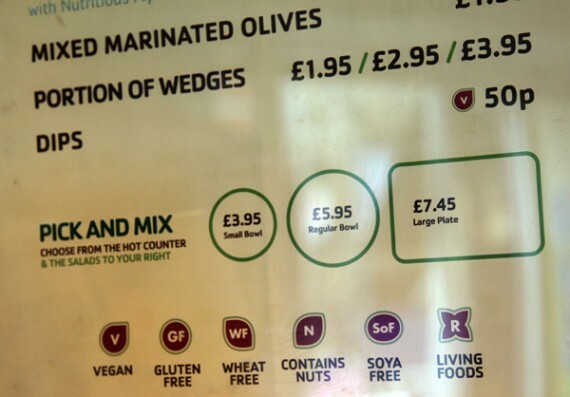 As any vegan knows, it’s MUCH easier to engineer vegan options from a strongly lacto-ovo menu than it is to try and eke out a vegan existence in a very meat-friendly establishment. 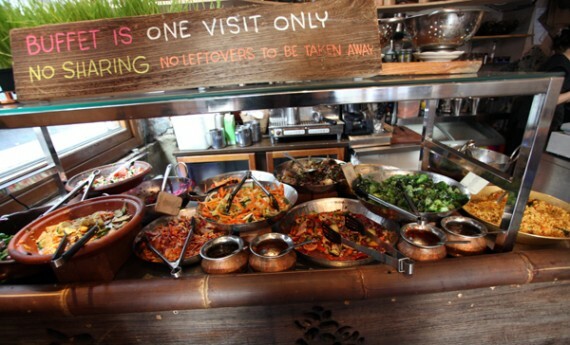 so…what happens when you combine an amazing location and vegetarian ethics with healthy/fresh/delicious cuisine? tibits in london, that’s what!